A TROPICAL ISLAND BEACH WEDDING used to be a fantasy that brides-to-be sighed over hopelessly. Today, destination weddings are almost essential in an age where his folks live in Europe, mum lives in New Zealand, and uncle Bob is floating around somewhere between Thailand and Myanmar. Bali and the Gili islands are not just perfectly located half way between Europe and New Zealand, with year-round sunshine – they’re spectacular locations for an unforgettable destination beach wedding. Say “I do” in a private estate on Gili Trawangan, or barefoot on the beach at sunset in Gili Meno? Casual beach bar and grill for the wedding reception or a dazzling banquet? Whatever your heart desires, a Gili island wedding planner is a must. There are a few extra logistics when it comes to pulling off a desert island wedding. Beach weddings in the Maldives of the east are more affordable than you might think. Desert island weddings in the Gili islands offer something a little more special than beach weddings in Bali. Wedding packages in the Gili islands are so competitively priced, that you really get the option to splash out on your big day. But there are a few downsides. For one, there’s no controlling the weather. Even during sunshine season, a tropical storm might invade the island. Always have a rain plan, even on paradise. Secondly, when it comes to planning a wedding in the Gili islands, you need to be flexible and go with the flow. Island weddings are not for the extreme control freaks and bridezillas of the world. Supplies are sent to the island a few days ahead of the wedding. And orders are locked down several weeks prior. That means no last minute changes, and no sulking if they couldn’t get enough scallops to feed an army that week. 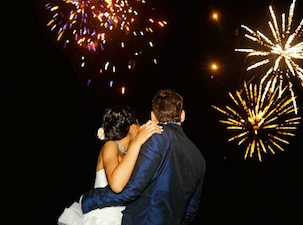 Now onto all that’s fabulous about getting hitched in the Gili islands (including cheap fireworks permits). 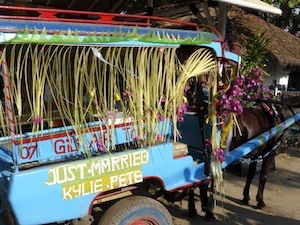 Here are just a few tips for planning a Gili island wedding. These are the most sought after resorts for Gili island weddings. Ko-ko-mo resort, a fabulous boutique villa resort that’s perfect for smaller groups of about 20 – 50 people. This would suit a chic couple that wants to be in the heart of Gili Trawangan’s social scene. The pretty sea front restaurant is helmed by Sydney chef Matthew Blundell. Your wedding dinner will be an impressive line up of classic fine dining, gorgeous seafood and delicious Australian wine. Pondok Santi, a beautifully manicured and sprawling estate that’s perfect for large parties with children. The grounds of the estate and private beachfront away from the crowds are the perfect setting for a classy island wedding ceremony. And for an extra special touch, sail into the sunset for a quiet moment before the festivities begin on the estate’s exquisite handcrafted boat. Scallywags resort on Gili Air, a wonderful spot for couples who want an elope-y style wedding on a deserted island (away from the crowds in Gili Trawangan). They cater to groups of up to 100, and put up an impressive marquee on the beach. You can just picture dancing the night away under a bewildering display of stars, bare feet in the warm sand.. isn’t it pretty? You might be on a deserted island paradise, but everything you need for a perfect beach wedding is right here. Your wedding planner will arrange a professional makeup artist and hair stylist, flowers and wedding decorations, a great wedding photographer (or videographer) and everything else you need for your special day on the island. As well as coordinating accommodation for you and your guests, fast boat transfers, wedding banquets, live music and anything else you can think of. Like fireworks..
Cheap (and readily available) fireworks permits have to be the best thing about weddings in the Gili islands. Imagine trying to organise your very own fireworks display in the western world. In the Gilis, fireworks permits cost less than US$500, and burn through about US$100 worth of fireworks per minute. They’re not huge on safety but did someone say, “Your very own fireworks display” ? Wedding packages start at around US$2,500 for the basics: your accommodation and transfers, the wedding planner’s fee, photographer, celebrant and some small concessions like a romantic beach wedding for two before the big day. As a rough guide, you’ll spend about US$100 per head (minimum 20 pax) on the best spread of fresh seafood, decent wine and cocktails. When it comes to destination weddings, guests are accustomed to covering their own travel and accommodation. Besides, it’s a great excuse to book one’s annual vacation. However, have your wedding planner coordinate a group accommodation booking (and celebratory discount) at a nice resort. After all, they’ve come all this way. Standout wedding planners with solid reputations for organising the best weddings in the Gili islands are White Sand Weddings and The Seven Agency. White Sands Weddings is run by Di Somerton, who’s lived in Lombok for almost a decade, and has worked with some of Sydney’s most influential and successful event management consultants. You just know you’ll be in good hands. The best way to approach an island wedding is to think about it as a celebration. The minute you get into the nitty gritty paperwork of a legal marriage in Indonesia, things start to get seriously messy. There’s numerous paperwork to fill out (followed by fees, and more fees), and you have to get your applications authorised by your own government. Why bother? If you want a full legal marriage in Indonesia however, it also needs to be a religious marriage, which gets a little complicated (and riddled with dubious fees and imposed gratuities). It also to be officially registered at the Civil Registry Office in Bali. Then you have to seek an appropriate minister (or bring your own). If you’re an atheist, then you’re in luck. A civil ceremony is a low fuss affair. Consult your local Indonesian embassy in your home country before you run off into the sunset. And, consult your local marriage registry if a legal wedding in Indonesia is a must for you. You’ll need to bring an authorisation letter from your home country, your birth certificate, a stash of passport sized photos and about US$650 to cover fees. Your wedding planner will take care of the rest. I totally love your writings regarding Gili Islands! I’ll be heading over to Gili Trawangan from the 15th to 18th August, Gili Meno from 19th to 20th, before heading over to Bali for my last 2 nights. I absolutely can’t wait to be there after reading all your posts!! Over at Gili, I plan to propose to my girlfriend of 5 years. 🙂 As she’s crazy into stars, I plan to propose to her right under the sky that is littered with thousands of stars. However, I do not have any strong set of photography skills, and I’m hoping that I can hire somebody to take a photo for my proposal, one that can capture the perfect moment with the beautiful sky. Do you happen to know anybody who would do that? Would appreciate if you can let me know if you have anybody in mind! Hello,im thinking of having a wedding in Indonesia. Is lombok or bali better for a nice beach wedding?which one would be cheaper or that I can get more for my money?Is it possible to have a really nice wedding for $5,000 there?